Sie sind hier: Home » Allgemein » Wieviel CO2 stoßen Vulkane aus? Wieviel CO2 stoßen Vulkane aus? Der CO2-Gehalt steigt stetig an und hat die 400 ppm mittlerweile überschritten. 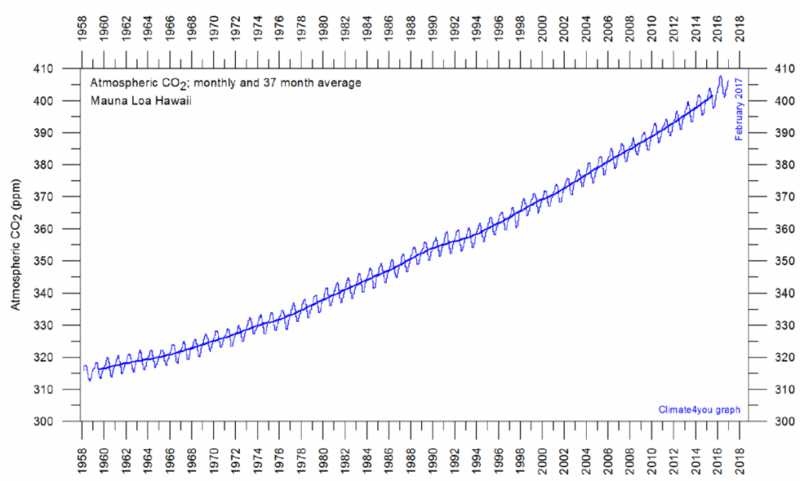 Gemessen wird das CO2 seit 1958 auf einem hawaiianischen Vulkan, dem Mauna Loa (Abb. 1). Abb. 1: Entwicklung der atmosphärischen CO2-Konzentration in der Erdatmosphäre. Messwerte vom Mauna Loa. Graphik: Climate4You. Weshalb wählte man gerade den Mauna Loa? Vulkane sind wohlbekannte CO2-Quellen, da wäre ein neutralerer, nichtvulkanischer Ort sicher angebracht gewesen. Trotzdem sind die Bedenken einer vulkanischen Beeinflussung der Messwerte wohl unberechtigt, denn der Mauna-Loa-CO2-Verlauf wurde zwischenzeitlich an vielen anderen Stellen der Erde bestätigt. Der Anstieg des CO2 in den vergangenen 150 Jahren ist Folge der Nutzung fossiler Brennstoffe im Zuge der Industrialisierung. Es stellt sich die Frage, inwieweit natürliche Prozesse zu diesem CO2-Anstieg möglicherweise beigetragen haben. Wenn man sich den CO2-Kreislauf anschaut, scheinen Vulkane eher wenig CO2 in die Atmosphäre zu pumpen. Laut dem 5. IPCC-Bericht (Arbeitsgruppe 1, Kapitel 6, Abbildung 6.1, Seite 471, pdf hier) stoßen Vulkane jährlich lediglich 100 Millionen Tonnen Kohlenstoff aus, während bei der Verbrennung fossiler Energierträger und bei der Zementherstellung 7,8 Milliarden Tonnen Kohlenstoff pro Jahr produziert werden. Vast ranges of volcanoes hidden under the oceans are presumed by scientists to be the gentle giants of the planet, oozing lava at slow, steady rates along mid-ocean ridges. But a new study shows that they flare up on strikingly regular cycles, ranging from two weeks to 100,000 years—and, that they erupt almost exclusively during the first six months of each year. The pulses—apparently tied to short- and long-term changes in earth’s orbit, and to sea levels–may help trigger natural climate swings. Scientists have already speculated that volcanic cycles on land emitting large amounts of carbon dioxide might influence climate; but up to now there was no evidence from submarine volcanoes. The findings suggest that models of earth’s natural climate dynamics, and by extension human-influenced climate change, may have to be adjusted. The study appears this week in the journal Geophysical Research Letters . “People have ignored seafloor volcanoes on the idea that their influence is small—but that’s because they are assumed to be in a steady state, which they’re not,” said the study’s author, marine geophysicist Maya Tolstoy of Columbia University’s Lamont-Doherty Earth Observatory . “They respond to both very large forces, and to very small ones, and that tells us that we need to look at them much more closely.” A related study by a separate team this week in the journal Science bolsters Tolstoy’s case by showing similar long-term patterns of submarine volcanism in an Antarctic region Tolstoy did not study. Volcanically active mid-ocean ridges crisscross earth’s seafloors like stitching on a baseball, stretching some 37,000 miles. They are the growing edges of giant tectonic plates; as lavas push out, they form new areas of seafloor, which comprise some 80 percent of the planet’s crust. Conventional wisdom holds that they erupt at a fairly constant rate–but Tolstoy finds that the ridges are actually now in a languid phase. Even at that, they produce maybe eight times more lava annually than land volcanoes. Due to the chemistry of their magmas, the carbon dioxide they are thought to emit is currently about the same as, or perhaps a little less than, from land volcanoes—about 88 million metric tons a year. But were the undersea chains to stir even a little bit more, their CO2 output would shoot up, says Tolstoy. Some scientists think volcanoes may act in concert with Milankovitch cycles –repeating changes in the shape of earth’s solar orbit, and the tilt and direction of its axis—to produce suddenly seesawing hot and cold periods. The major one is a 100,000-year cycle in which the planet’s orbit around the sun changes from more or less an annual circle into an ellipse that annually brings it closer or farther from the sun. Recent ice ages seem to build up through most of the cycle; but then things suddenly warm back up near the orbit’s peak eccentricity. The causes are not clear. Enter volcanoes. Researchers have suggested that as icecaps build on land, pressure on underlying volcanoes also builds, and eruptions are suppressed. But when warming somehow starts and the ice begins melting, pressure lets up, and eruptions surge. They belch CO2 that produces more warming, which melts more ice, which creates a self-feeding effect that tips the planet suddenly into a warm period. A 2009 paper from Harvard University says that land volcanoes worldwide indeed surged six to eight times over background levels during the most recent deglaciation, 12,000 to 7,000 years ago. The corollary would be that undersea volcanoes do the opposite: as earth cools, sea levels may drop 100 meters, because so much water gets locked into ice. This relieves pressure on submarine volcanoes, and they erupt more. At some point, could the increased CO2 from undersea eruptions start the warming that melts the ice covering volcanoes on land? That has been a mystery, partly because undersea eruptions are almost impossible to observe. However, Tolstoy and other researchers recently have been able to closely monitor 10 submarine eruption sites using sensitive new seismic instruments. They have also produced new high-resolution maps showing outlines of past lava flows. Tolstoy analyzed some 25 years of seismic data from ridges in the Pacific, Atlantic and Arctic oceans, plus maps showing past activity in the south Pacific. The long-term eruption data, spread over more than 700,000 years, showed that during the coldest times, when sea levels are low, undersea volcanism surges, producing visible bands of hills. When things warm up and sea levels rise to levels similar to the present, lava erupts more slowly, creating bands of lower topography. Tolstoy attributes this not only to the varying sea level, but to closely related changes in earth’s orbit. When the orbit is more elliptical, Earth gets squeezed and unsqueezed by the sun’s gravitational pull at a rapidly varying rate as it spins daily—a process that she thinks tends to massage undersea magma upward, and help open the tectonic cracks that let it out. When the orbit is fairly (though not completely) circular, as it is now, the squeezing/unsqueezing effect is minimized, and there are fewer eruptions. The idea that remote gravitational forces influence volcanism is mirrored by the short-term data, says Tolstoy. She says the seismic data suggest that today, undersea volcanoes pulse to life mainly during periods that come every two weeks. That is the schedule upon which combined gravity from the moon and sun cause ocean tides to reach their lowest points, thus subtly relieving pressure on volcanoes below. Seismic signals interpreted as eruptions followed fortnightly low tides at eight out of nine study sites. Furthermore, Tolstoy found that all known modern eruptions occur from January through June. January is the month when Earth is closest to the sun, July when it is farthest—a period similar to the squeezing/unsqueezing effect Tolstoy sees in longer-term cycles. “If you look at the present-day eruptions, volcanoes respond even to much smaller forces than the ones that might drive climate,” she said. Daniel Fornari, a senior scientist at Woods Hole Oceanographic Institution not involved in the research, called the study “a very important contribution.” He said it was unclear whether the contemporary seismic measurements signal actual lava flows or just seafloor rumbles and cracking. But, he said, the study “ clearly could have important implications for better quantifying and characterizing our assessment of climate variations over decadal to tens to hundreds of thousands of years cycles.” Edward Baker, a senior ocean scientist at the National Oceanic and Atmospheric Administration, said, “The most interesting takeaway from this paper is that it provides further evidence that the solid Earth, and the air and water all operate as a single system.” The research for this paper was funded in large part by the U.S. National Science Foundation. Da die Tiefseevulkane noch immer schlecht kartiert und verstanden sind, könnte sich der vulkanische CO2-Beitrag in den Kohlenstoffzyklus-Modellen noch ändern. Mike Burton vom Italian National Institute of Geophysics and Volcanology geht davon aus, dass Vulkane pro Jahr um die 600 Millionen Tonnen CO2 ausstoßen. Das sind etwa andertahlb mal soviel, wie vom IPCC im letzten Bericht behauptet (eine Tonne Kohlenstoff entspricht 3,67 Tonnen CO2). First of its kind study quantifies deep carbon emissions. Scientists at the University of New Mexico conducted research to effectively study carbon emissions through fault systems in the East African Rift (EAR) in an effort to understand carbon emissions from the Earth’s interior and how it affects the atmosphere. Carbon dioxide (CO2) from Earth’s interior is thought to be released into the atmosphere mostly via degassing from active volcanoes. CO2 can also escape along faults away from active volcanic centers. However, such tectonic degassing is poorly constrained, and to date has been largely unmeasured. The research, funded by the National Science Foundation (NSF) Tectonics Program, is directed by UNM Professor Tobias Fischer and is part of a continued effort to better quantify global emissions of CO2 from the Earth’s interior. Led by UNM Ph.D. student Hyunwoo Lee, the lead author of the paper titled, Massive and prolonged deep carbon emissions associated with continental rifting published in Nature Geoscience, the scientists set out to measure diffuse CO2 flux from the Magadi-Natron basin in the East African Rift (EAR) between Kenya and Tanzania. “CO2 is the main source of the greenhouse effect,” said Lee. “Natural carbon emissions come from volcanoes and are derived from magma. Mostly, people have thought the major sources of magmatic emissions have come through active volcanic events. Our research is the first attempt to quantify magmatic CO2 gases from non-volcanic and continental rift regions.” The EAR is the world’s largest active continental rift and is comprised through distinct western and eastern sectors. Several active volcanoes emit large volumes of CO2 including Nyiragongo in the Congo and Oldoinyo Lengai in Tanzania. Additionally, significant amounts of CO2 are stored in large anoxic lakes in this region. “To measure diffuse CO2 flux, we used an EGM-4 CO2 gas analyzer with a cylindrical accumulation chamber,” Lee said. “The gas samples were then diverted from the chamber into pre-evacuated glass vials in order to carry out gas chemistry and carbon isotope analyses in our laboratories at UNM.” Additional gas samples collected along fault zones in the Magadi-Natron basin showed an elevated CO2 flux and provided further evidence that faults act as permeable pathways facilitating the ascent of deeply-derived CO2. This particular study area represented a conservative 10 percent of the entire Natron-Magadi region. The data from all samples were then compared to gas data from the active volcano Oldoinyo Lengai and found to have carbon isotope compositions that indicated a strong magmatic contribution to the observed CO2. James Muirhead, a doctoral student at the University of Idaho, focused on the relationship between the structure of the faults and the gas they released, including what controls carbon dioxide flow from depth and what volumes of gas the faults release. Combing the CO2 flux data and fault structures with carbon isotopic analyses, conducted at UNM’s Center for Stable Isotopes (CSI), the research generated interesting data allowing the scientists to quantify the massive and prolonged deep carbon emissions through faults. “We found that about 4 megatonnes per year of mantle-derived CO2 is released in the Magadi-Natron Basin, at the border between Kenya and Tanzania,” Lee said. “Seismicity at depths of 15 to 30 kilometers detected during our project implies that extensional faults in this region may penetrate the lower crust.” Thus, the ultimate source of the CO2 is the lower crust or the mantle, consistent with the carbon isotopes measured in the gas. The findings suggest that CO2 is transferred from upper mantle or lower crustal magma bodies along these deep faults. Extrapolation of the measurements to the entire Eastern branch of the rift system implies a huge CO2 flux 71 megatonnes per year, comparable to emissions from the entire global mid-ocean ridge system of 53 to 97 megatonnes per year. “It is often argued that large volcanic eruptions instantly transfer significant amounts of CO2 and other gases into the atmosphere where they affect the global climate over a few years,” Fischer said. “On human time-scales, continental rifting is extremely slow at spreading rates of mm’s per year but on geologic time-scales, rifting can be considered a catastrophic continental break-up event.” “Widespread continental rifting and super-continent breakup could produce massive, long-term CO2 emissions and contribute to prolonged greenhouse conditions like those of the Cretaceous,” Lee added. Large-scale rifting events could play a previously unrecognized role in heating up the atmosphere and perhaps ending global ice ages. “It is important to note, however, even when including the newly quantified CO2 emissions from the EAR in the global CO2 budget, natural emissions are dwarfed by emissions from fossil fuel use, which were 36 giga tons of CO2 in 2013,” Fischer said. “This comparison shows that humanity is currently emitting the equivalent of 500 East African Rifts in CO2 to the atmosphere per year.” Cindy Ebinger, a professor of earth and environmental sciences at the University of Rochester, coordinated field activities near the Kenya-Tanzania border and analyzed earthquake patterns within the rift zone. Lee says the scientists plan to measure diffuse CO2 flux and collect gas samples from other areas in the EAR to better constrain how much it releases deep carbon to try to better constrain how much deeply derived CO2 comes from natural systems. Additional scientists involved in the study included: Distinguished Professor Zach Sharp, UNM Department of Earth and Planetary Sciences; Simon Kattenhorn, University of Idaho; and Gladys Kianji, University of Nairobi (Kenya). The pools range in size from 1 to 5 meters diameter, and scientists believe they are ephemeral, appearing and disappearing like a rain pool in the desert. Camilli and his colleagues from the University of Girona, National and Kapodistrian University of Athens, Institut de Physique du Globe de Paris, and Hellenic Centre for Marine Research, working in the region in July 2012, used a series of sophisticated underwater exploration vehicles to locate and characterize the pools, which they call the Kallisti Limnes, from ancient Greek for “most beautiful lakes.” A prior volcanic crisis in 2011 had led the researchers to initiate their investigation at a site of known hydrothermal activity within the Santorini caldera. During a preliminary reconnaissance of a large seafloor fault the University of Girona’s autonomous underwater vehicle (AUV) Girona 500 identified subsea layers of water with unusual chemical properties. Where is this CO2 coming from? The volcanic complex of Santorini is the most active part of the Hellenic Volcanic Arc. The region is characterized by earthquakes caused by the subduction of the African tectonic plate underneath the Eurasian plate. During subduction, CO2 can be released by magma degassing, or from sedimentary materials such as limestone which undergo alteration while being subjected to enormous pressure and temperature. The researchers determined that the pools have a very low pH, making them quite acidic, and therefore, devoid of calcifying organisms. But, they believe, silica-based organisms could be the source of the opal in the pool fluids. Until the discovery of these CO2-dense pools, the assumption has been that when CO2 is released into the ocean, it disperses into the surrounding water. “But what we have here,” says Camilli, “is like a ‘black and tan’ – think Guinness and Bass – where the two fluids actually remain separate” with the denser CO2 water sinking to form the pool. The discovery has implications for the build up of CO2 in other areas with limited circulation, including the nearby Kolumbo underwater volcano, which is completely enclosed. “Our finding suggests the CO2 may collect in the deepest regions of the crater. It would be interesting to see,” Camilli said, adding it does have implications for carbon capture and storage. Sub-seafloor storage is gaining acceptance as a means of reducing heat-trapping CO2 in the atmosphere and lessening the acidifying impacts of CO2 in the ocean. But before fully embracing the concept, society needs to understand the risks involved in the event of release. Temperature sensors installed by the team revealed that the Kallisti Limnes were 5°C above that of surrounding waters. According to co-author Javier Escartin, “this heat is likely the result of hydrothermal fluid circulation within the crust and above a deeper heat source, such as a magma chamber.” These temperatures may provide a useful gauge to study the evolution of the system. Escartin added that “temperature records of hydrothermal fluids can show variations in heat sources at depth such as melt influx to the magma chamber. The pool fluids also respond to variations in pressure, such as tides, and this informs us of the permeability structure of the sub-seafloor.” Changes in the pools’ temperature and chemical signals may thus complement other monitoring techniques as useful indicators of increased or decreased volcanism. This European – American research collaboration was funded through support from the EU Eurofleets program, Institut de Physique du Globe de Paris, Hellenic Centre for Marine Research, the US National Science Foundation, and NASA’s astrobiology program (ASTEP) which supports autonomous technology development to search for life on other planets. “From a technology perspective, it was a big step forward,” Camilli said. Siehe auch Chiodini et al. 2015 mit einer Studie in Geology zu den Campi Flegrei.